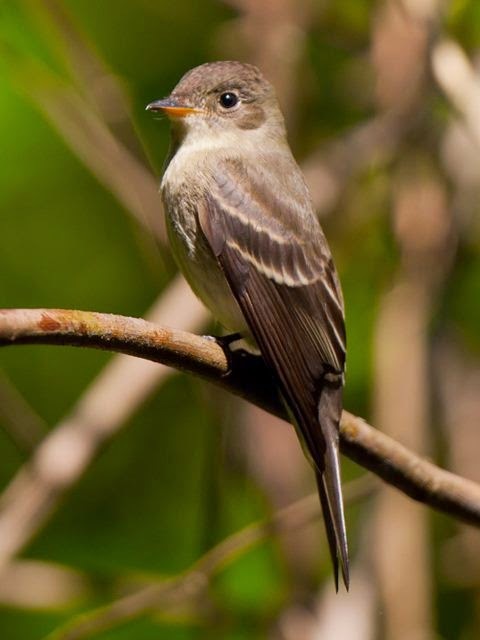 Adding a dash of adorable to the Inn on Mill Creek Bed & Breakfast in the summertime, the Eastern Wood-Pewee gets the nod as our August 2014 bird in our 12 Months of Birding at the Inn series on the blog. As a flycatcher, the Eastern Wood-Pewee’s diet is mostly insects, including flies, crickets, grasshoppers, butterflies and moths, and even bees and wasps. You can often find the Eastern Wood-Pewees perched on branches of trees and rhododendron that line the pond at the Inn on Mill Creek, waiting for a little snack to fly by. They are amazing to watch when they catch insects in mid-air! They also eat small berries and seeds. Another way to single out the Eastern Wood-Pewee from other birds is by identifying its song. They tend to sing, loudly and often, during the day. Listen for three sliding notes that sound like “pee-a-weeeee” and you’ll know who the afternoon’s performer is: the Eastern Wood-Pewee.